Nick and Lindsay held their wedding reception at the Plazzo Grande in Shelby Twp. We really like this venue, because they have tall vaulted ceilings. The couple decided to have lighting design to enhance the overall look of the room. It was great, because the teal color we used for the fixtures matched their cake, linens, and attire. We first met Nick and Lindsay several years before their own. It turns out that Nick’s brother is Joe and we originally did his wedding. You can read more about his event highlights here, and if you look in the top picture you will notice the picture of Nick and Lindsay as guests. The music was a mix of top 40 with the classic throwbacks. You can read what the couple had to say here and here. Since Nick was a huge Guns N Roses fan, we had to send them off in style. 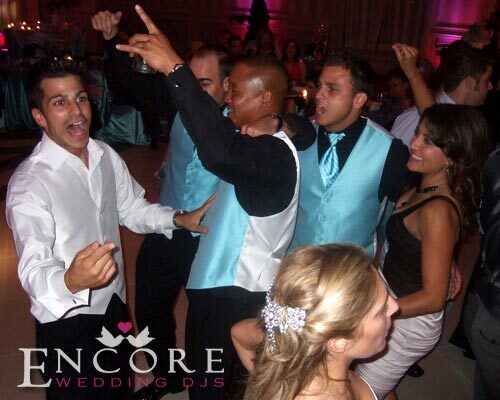 Before you knew it, guests were doing the air guitar to one of Nick’s favorite songs (Sweet Child O Mine)… High Fives are a must in this situation!